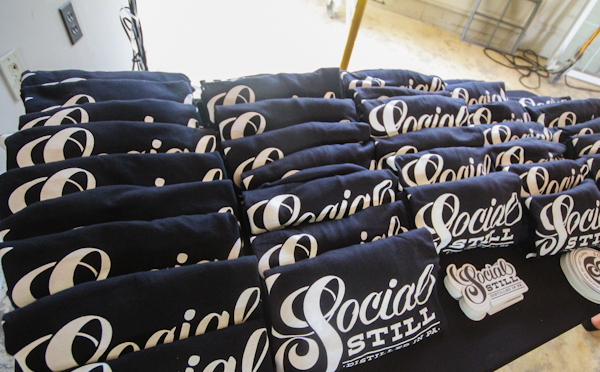 At a press conference today, Social Still distillery was officially announced by Bethlehem Mayor Bob Donchez and PA Senator Lisa Boscola, as well as former Bethlehem Mayor John Callahan and proprietors Adam Flatt and Elaine Pivinski. 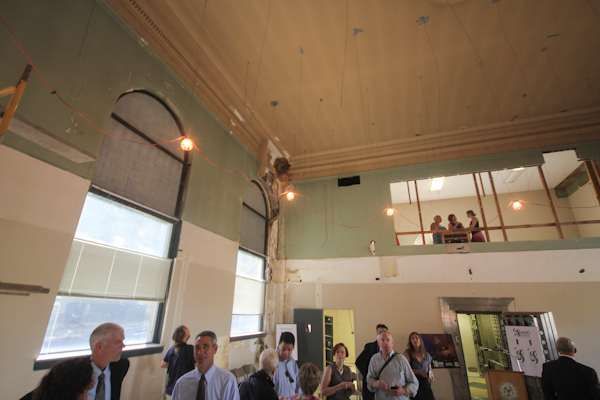 The distillery, which we broke the news about last month, is the first project under Bethlehem’s CRIZ (City Revitalization and Improvement Zone) designation, and the first CRIZ project in the state, according to Boscola. Officials involved with the project noted that the distillery wouldn’t have happened without the financial incentives the CRIZ offers. 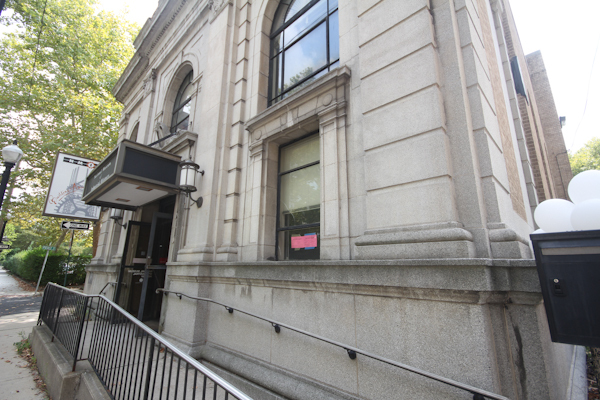 The building, a former bank, was built in 1922 and sits at 530 E 3rd St on Route 412, one of Bethlehem’s main thoroughfares. Elaine Pivinski, the owner and founder of Franklin Hill Vineyards, the Lehigh Valley’s first winery, opened 35 years ago, and her son, Adam Flatt, will be heading up the project. Originally supposed to open at the family’s vineyard, the team decided to open in South Bethlehem after meeting with economic development officials. Construction of the distillery is being undertaken by Boyle Construction, who has overseen the building of the Bethlehem Visitor’s Center, the Levitt Pavilion, and is currently working on the Hoover Mason Trestle Rehab just steps away from the distillery. 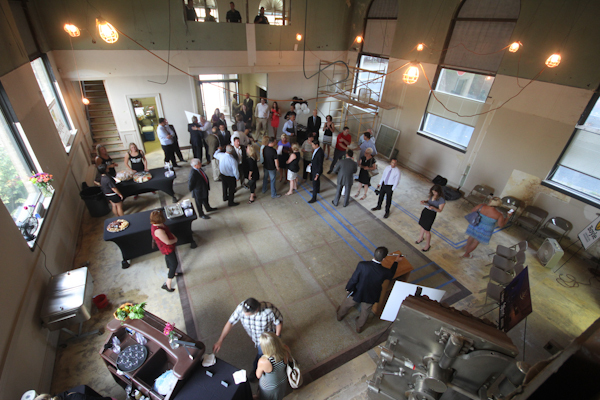 The new distillery will offer retail items, bottles for takeout, cocktails, small plates of food in a dining area, and a private mezzanine for parties. 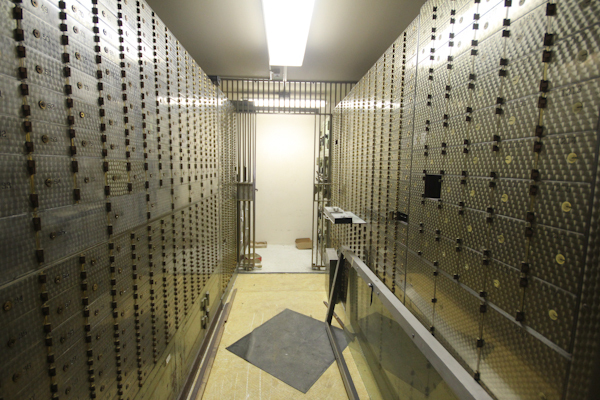 Initially offering gin and vodka, they will eventually expand to include aged spirits like whiskey and bourbon. 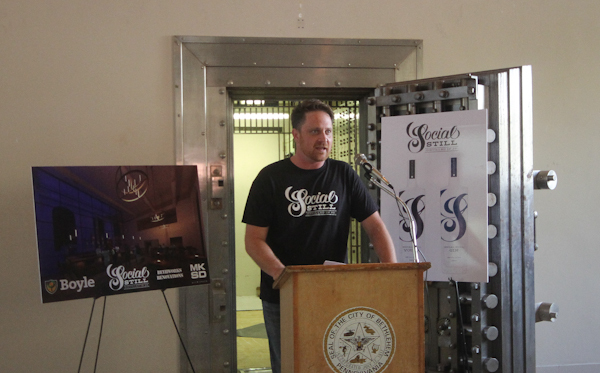 Mr. Flatt also mentioned the possibility of rum and agave-based spirits, as well as flavored gins and vodkas. Franklin Hill will also operate a small wine store within the distillery, allowing guests to purchase a full range of Franklin Hill products in one spot. 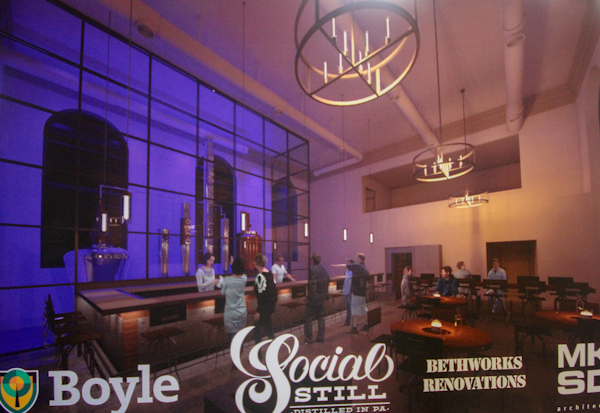 The team hopes to have the distillery completed and ready by November 30th, and will distill an estimated 2000-3000 gallons of liquor in their first year, accounting for 10,000-20,000 bottles. Maria Sebastionelli, currently an assistant winemaker at Franklin Hill, attended a variety of one-day seminars and a distilling class at Kothe Distilling in Chicago and will serve as the head distiller at Social Still. 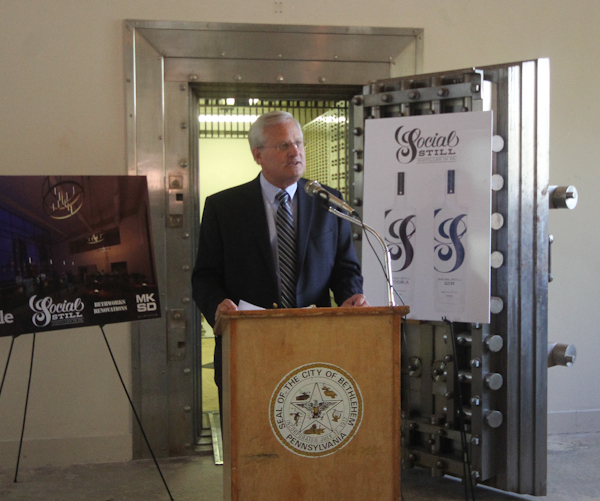 Mr. Flatt said the distillery will experiment with a variety of recipes, and may use Franklin Hill’s grapes as a base for the distillery’s gin and vodka. 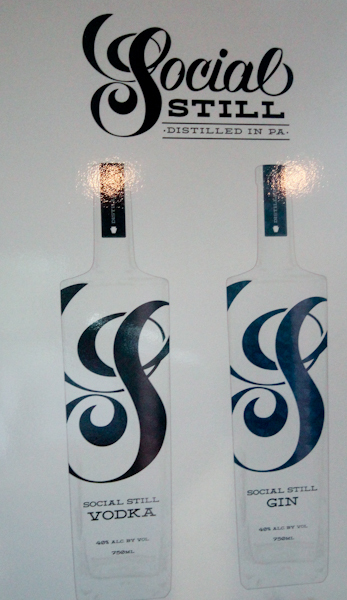 In addition to being available at the distillery, Mr. Flatt said the team hopes to get their product into Pennsylvania Wine & Spirits stores, bars throughout Pennsylvania, and expand distribution to include other states and potentially even Europe. Stop back for construction updates in the coming weeks. Great reporting. Informative and you shared the excitement and the news of todays press release. I am a spirits bottle manufacturer and would like to get your company quotes on your type spirit bottles used. If you would email or phone me, I will gladly look to quote you on your type spirit bottles. We are open for 7 years and sell both spirit and wine bottles and have warehouses nationwide. Adam I am Gary Liepper from Glopak USA the Spirits Bottle Manufacturer and we spoke earlier today on the phone. Please phone me when you have the chance this afternoon, we are sending now today to you a quote on the Nordic Spirits 375 Bottles that we have in stock ready to you right now, please phone me after you see our quote to proceed. Adam I would also like to know the type Wine Bottles you are using and their colors to email you a quote on them also, we are opening up warehouses in PA this month and have fully loaded warehouse nationwide to help serve your company. I am hoping Glopak USA might have the opportunity of doing business with you and your company in the very near future.